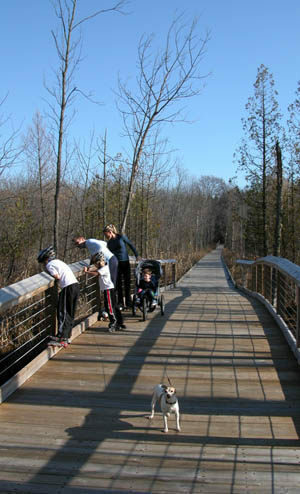 River Loop is a 2.2-mile paved loop through the Clinton River Flood Plain Natural Area, a vast, wooded wetland that is the headwaters of the Clinton River. Part of the trail follows the paved lane along the park entrance road from Sashabaw Road. Among the many parking areas to pick up the River Loop is across from Pine Grove Shelter, just beyond the contact station. From Pine Grove Shelter, head south on the paved path and you’ll quickly reach the junction where River Loop departs from paved lane by crossing the park road. On the other side it winds through the woods but stays within view of a grassy meadow, dotted with bluebird houses, before reaching Wilderness Bridge in 0.6 mile from Pine Grove and passing through Camp Wilderness. 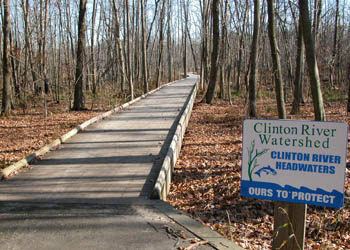 The trail then arrives at a boardwalk that extends almost a quarter mile through the wetlands and in the middle arches over the Clinton River. The boardwalk is amazing and so is the area it passes through, an intriguing wetland you can experience while keeping your boots dry. You leave the marsh and continue in the woods, crossing another boardwalk along the way and passing a spur to Beach Cove Shelter. With a mile from Pine Grove River Loop Trail pops out at a junction with the Lakeshore Trail near the boathouse. 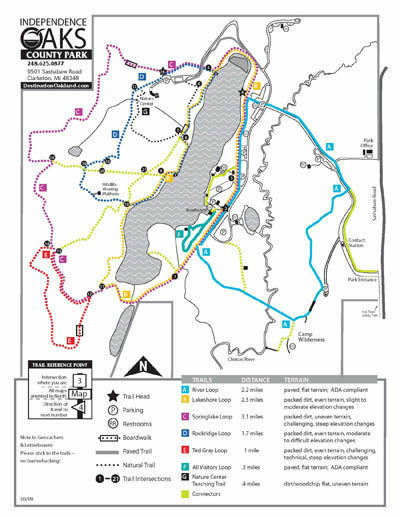 The paved trail then swings north and winds through the developed picnic areas and playscapes on the east side of Crooked Lake, passing several fishing docks along the way. At Trailside Shelter you would head east to skirt the park road to Pine Grove Shelter. Independence Oaks is located near the village of Clarkston and can be reached from I-75 by departing at exit 89 and heading north on Sashabaw Road for 2.5 miles. Once inside the park, follow signs to the nature center.